‘14. Señor Capablanca, for reasons of weight, cannot agree to begin the match before 1 January 1921. The full document was reprinted on pages 108-109 of our book on Capablanca. This was subsequently confirmed by a letter received by Capablanca through Walter Penn Shipley of Philadelphia, who has been named as the temporary referee of the match. Instinctively chessplayers here felt that this was not all there was to the case and in this they were quite right. Naturally, there was more or less surmise as to the real reasons underlying the champion’s decision to take the step, because few believed that the conditions were so “unpopular” but that, with a little concession on both sides, they might readily be whipped into shape to meet the desires of the principals and backers of the match. Not until a month later did any additional explanation reach here from abroad. It appears that Dr Lasker, somewhat discouraged by the unresponsive attitude of the world at large, was unwilling to sacrifice nine months of his life, as he puts it, to a match for which there was a general desire but no really substantial support. Five months, he adds, have elapsed since he and Capablanca signed articles and in all that time received no encouragement outside of the Netherlands. He makes no mention of the offer of $20,000 from Havana, and the presumption is that he had not heard of it at the time he made his abdication in favor of the young Cuban master. Additional light and, perhaps, not the least important, is shed upon Dr Lasker’s mental condition when, in the course of a brief but highly complimentary reference to Capablanca, he remarks: “He stands above national jealousy.” Concluding, he says: “My feelings are outraged and in such circumstances one cannot be at his best.” This, too, will be regarded as highly significant. Meanwhile Capablanca had let it be made known that his home town, Havana, was prepared to subscribe the sum of $20,000 if the games of the match were played there, on the strength of which it was not unnatural to suppose that the financial troubles of the players were at an end and that the contest was sure to take place. On page 127 the American Chess Bulletin also quoted from (a) Amos Burn’s column in The Field of 3 July 1920 (Burn welcomed Lasker’s resignation in view of the ‘one-sided conditions he insisted on when called upon to defend his title’ but wondered ‘whether a holder of the world’s championship has the right, upon resigning, to transfer it to any nominee at all’), (b) E.S. Tinsley in the (London) Times of 26 June 1920 (‘Dr Lasker is quite right in thinking the chess world did not like the conditions, but if this unpopularity is a matter of concern to him he would have done more wisely to take it into account before formulating the conditions he insisted on’) and (c) the Rochester Democrat and Chronicle (‘In making a gift of the world’s chess championship to José Capablanca, Emanuel Lasker assumes the exercise of a power which he does not possess’). ‘What is serious is that he arrogates to himself the right to nominate his successor. This right cannot be allowed by the chess world. We are of the opinion that, Lasker apart, possibly Lasker included, Señor Capablanca is the strongest of living players. The chess championship, however, cannot be gained on reputation. It must be won by play, and we incline to say by play in a match definitely contested for the title. Lasker having retired without losing a match, the title must be considered temporarily in abeyance. … There is one distinct compensation in the otherwise unfortunate position which has now arisen with regard to the world’s championship title. This position would not have arisen if there had been in existence the International Chess Federation which was at least on the way to formation when the War broke out. After Lasker’s name at the end of the text came Capablanca’s, with the statement, ‘I agree to the above conditions’. “I shall no more be champion. Should I win the title in the contest at Havana, it will be only to surrender it to the competition of the young masters. It is a pity that the chess world is not organized. That 20 people pull in 20 different directions does no good. Let those who have the cause of chess at heart find themselves and work together. ‘In case the match with Dr Lasker is played and I remain the champion, I shall insist in all future championship matches that there be only one session of play a day of either five or six hours, preferably six. … As the champion of the world, I shall insist in introducing modifications in the playing rules of matches and tournaments that will tend to make them more attractive to its supporters, at the same time always safeguarding the interests of the real masters. In whatever modification I may introduce in the championship rules I shall look for no personal advantage either of a psychological character or otherwise, but will always be guided by three things, viz: 1, the interests of the chess masters; 2, the interest of the chess public, and 3, last but not least, the interest of chess, which to me, far more than a game, is an art. The same page of the Bulletin named the four parties each contributing $5,000 to the purse: Hon. Mario G. Menocal (President of Cuba), Señor Regino Truffin (President of the Union Club), Señor Aníbal Mesa (‘who is reputed to have reaped an immense fortune from the sugar business last year’), and the Marianao Casino. Although Lasker was later to maintain this standpoint in, in particular, his book Mein Wettkampf mit Capablanca (Berlin and Leipzig, 1922), the chess world took scant notice. Thus page 97 of the May-June 1921 American Chess Bulletin had a feature entitled ‘José Raúl Capablanca, the Champion’ which contained such references as ‘the defeated champion had not won a single game’ and ‘Hail to Caissa’s new lord and master: José Raúl Capablanca’. The confusion and controversy in 1920-21 are well illustrated by the German chess press. 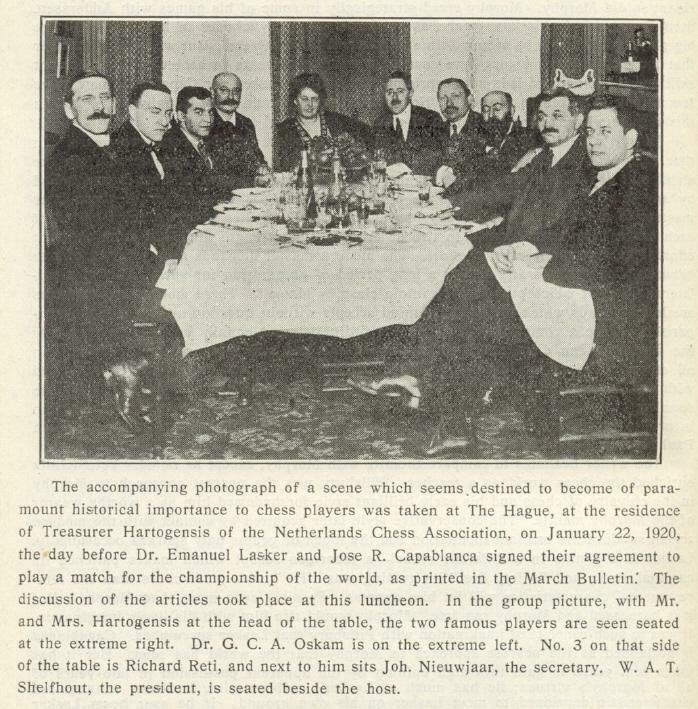 After the news broke of Lasker’s resignation, the July 1920 Deutsche Schachzeitung (page 145) had the headline, ‘Capablanca, der neue Schachweltmeister’. Page 161 of the 22 August 1920 issue of Deutsches Wochenschach responded with the headline ‘Capablanca – nicht Weltmeister’. When the August-September 1920 Deutsche Schachzeitung discussed the provision in the August 1920 agreement that Capablanca was already champion, a footnote on page 199 remarked that this was a view against which the entire chess world was rebelling (‘Eine Ansicht, gegen die sich die gesamte Schachwelt auflehnt’). Despite having entitled an article ‘Capablanca the new world chess champion’ in June 1920, the Deutsche Schachzeitung came out with the identical sentiments (including the word ‘new’) in a heading on page 112 of its May 1921 issue, following the conclusion of the Havana match. i) The January 1920 draft agreement signed by Lasker and Capablanca stipulated that if Lasker resigned his title the Cuban would become world champion. ii) Lasker announced his abdication in June 1920, at which time no specific venue or dates for a match with Capablanca had been established. iii) Since Capablanca wished to become world champion by defeating Lasker over the board, he reacted to Lasker’s statement by going to the Netherlands to negotiate with him, in August 1920. During those discussions (and afterwards) Lasker maintained that he was no longer the world champion, and in the text of the two masters’ agreement to play a match in Havana Capablanca accepted Lasker’s abdication in his favour. Ten days later Capablanca again declared his acceptance of the world championship title. iv) Nevertheless, when the match ended, in April 1921, Capablanca was officially declared in Havana ‘the new world’s champion’. v) The press was dismissive of Lasker’s wish to confer the title on Capablanca, even questioning the legality of such an initiative, and in 1921 it regarded the Cuban as having become world champion by dint of defeating Lasker over the board.